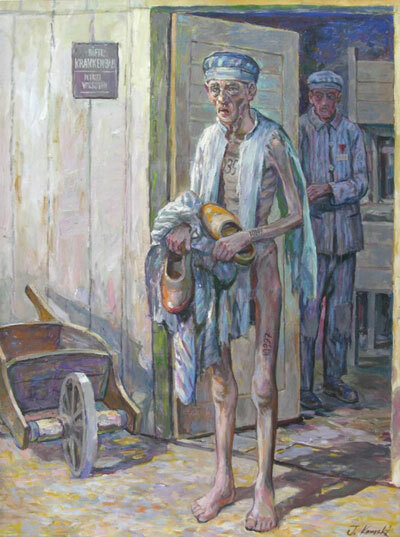 The exhibition "People in the Camp Hospital in Auschwitz" tells the story of the camp hospital, block 28 as an example of such, within the main camp of Auschwitz I. The exhibition outlines the story of the people who lived in the block as patients or prisoner- hospital staff. Block 28, preserved, from the beginning to the end of the camp, was the main hospital block of Auschwitz 1 . The patients reported here for admission to the so-called. Krankenbau. In the ‘out-patients' department decisions were taken about their further fate: admission to the hospital, or what usually occurred, only to give emergency assistance. pharmacy, a small surgical room which served also as a dissection room and even dietary kitchen. On the first floor there was an "internal ward" and rooms for staff block prisoners. So everything was arranged perfectly - just as it should be in every hospital, which saves a human life. It is worth asking yourself whether the hospital at Auschwitz was such a place? Are they giving help to everyone in need, if they were, how were lives saved here? Exhibition : "The People in the Camp Hospital at Auschwitz ..." is an attempt to answer these questions. The materials used in the exhibition, including in particular the fragmentary so-called records book of the Krankenbau are from the archives and collections departments of the State Museum of Auschwitz-Birkenau. Support came also from institutions such as the National Digital Archives, Museum of the Holocaust, Yad Vashem in Jerusalem, as well as schools and universities with connections to prisoners. Great help was received in reconstructing individual lives by the former prisoners families who agreed to share previously unknown personal memorabilia of their loved ones. Without the cooperation of families the full history of many of the prisoners would not be known, and this exhibition would be much poorer.